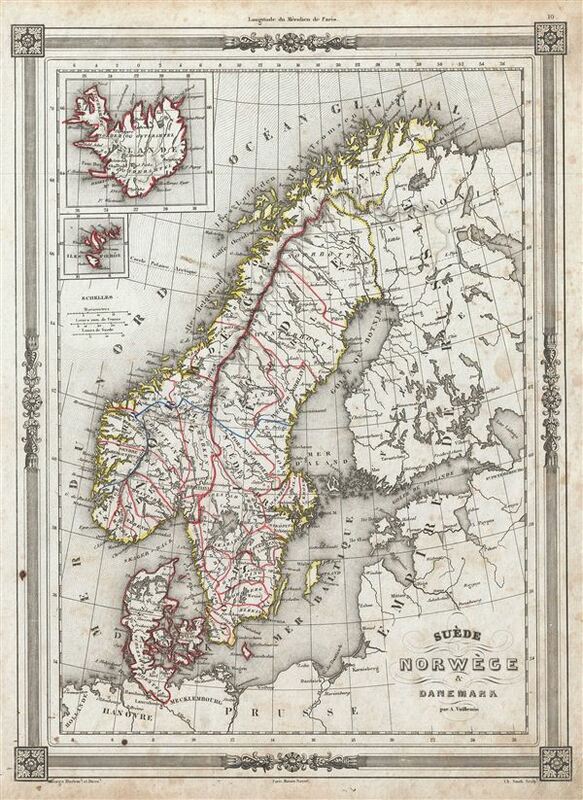 An uncommon and extremely attractive 1852 map of Scandinavia by A. Vuillemin. The map covers from the Arctic Sea south to Denmark and east as far as the Gulf of Finland. Includes the modern day nations of Sweden, Norway and Denmark. Two inset maps in the upper left detail Iceland and the Faroe Islands, respectively. Throughout, the map identifies various cities, towns, rivers and assortment of additional topographical details. Of particular interest is the legendary Lofoten Maelstrom in northwestern Norway. This legendary whirlpool was the inspiration for edgar Allen Poe's classic tale Descent into the Maelstrom. In reality, it is a periodic and powerful current caused by tidal variations in the region. Features a beautiful frame style border. Prepared by A. Vuillemin for publication as plate no. 10 in the 1852 Maison Basset edition of Atlas Illustre Destine a l'enseignement de la Geographie elementaire. Very good. Blank on verso. Map exhibits some soiling and toning, especially to margins.